Carli Samuelson. Photo by Linsday Thomas. Carli Samuelson is from Boiling Springs, Pennsylvania. She trained at Central Pennsylvania Youth Ballet and Pacific Northwest Ballet School. Ms. Samuelson danced for Pennsylvania Ballet before joining Pacific Northwest Ballet as a corps de ballet dancer in 2008. In 2011, Ms. Samuelson performed as a guest artist on Central Pennsylvania Youth Ballet’s “Stars of CPYB” performance. When you were a young child, did you always have to be a dancer? There is a story that goes along with that! When I was six years old, I was juggling my time between playing soccer and taking ballet classes. One day, I threw a fit because I didn’t want to go to ballet. My mom persisted I follow through with my first performance in a few months. Afterwards, I could continue dancing or quit if I still didn’t enjoy it. After the show, I realized how much I loved performing and haven’t looked back since. In morning company class, do you prefer turning or jumping? Who has been your most favorite choreographer to come to PNB? Williams Forsythe. He was incredibly inspiring and encouraged me to be the best dancer. I felt like I danced better because of his positivity. His time with PNB was definitely a highlight of my career. Top three most important items in your dance bag? Foot roller – I couldn’t go a day dancing without rolling the bottom’s of my feet. Two tennis balls – I wrap two tennis balls with duck tape and then I use it to roll my spin. Alcohol spray – Many of the PNB dancers have adopted this trick of mine. I have a small spray bottle filled with rubbing alcohol and I spray it to soften the hard parts of my Pointe shoes. 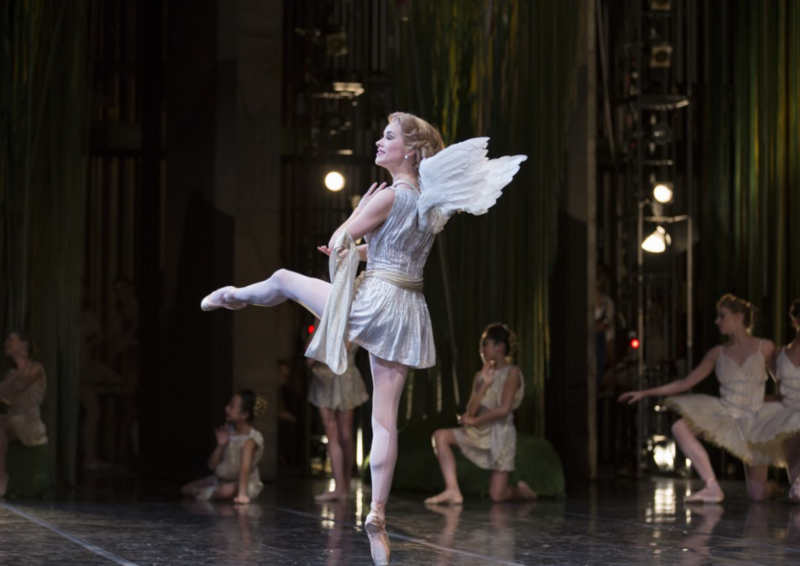 Carli Samuelson as Cupid in Don Quixote. Photo by Angela Sterling; choreography by Alexei Ratmansky. Carli Samuelson as Puss in Boots in The Sleeping Beauty. Photo by Angela Sterling. Carli Samuelson in The Vertiginous Thrill of Exactitude. Photo by Angela Sterling; choreography by William Forsythe. Carli Samuelson in Petite Mort. Photo by Angela Sterling; choreography by Jiri Kylian.